Gripper socks help prevent people from slipping. Gripper socks are also known as non-skid and non-slip socks because they have silicone or rubber on the bottom to provide traction. 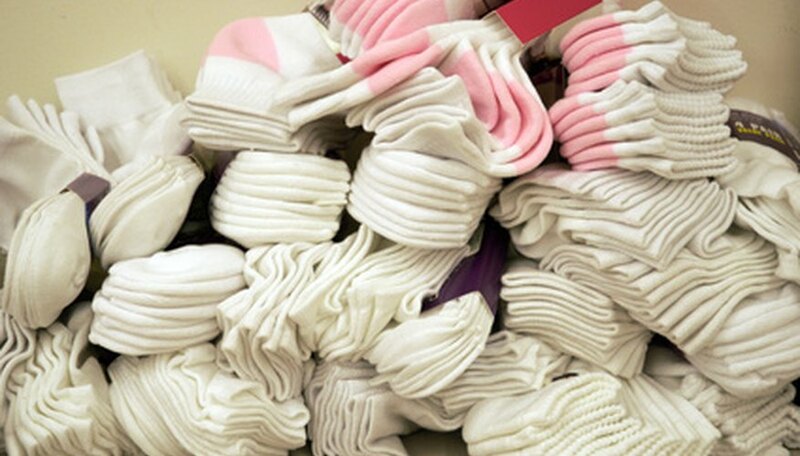 Store-bought gripper socks usually have simple white lines on the bottom. Even though you can't see the designs on the bottom of the socks when you are wearing them, the secret knowledge of the colors and words may bring a smile to your face. Cut out pieces of cardboard slightly larger than the socks you want to decorate. Stick the cardboard inside the socks. Draw a few designs on paper before you start decorating the socks; you have one chance at making them error free. Squeeze the puff paint into different designs on the sock bottoms. Smiley faces, geometric shapes, letters and numbers are simple designs you can use to personalize the socks. Write a person's name on the socks or draw squiggly lines for a simple pair of gripper socks. A more elaborate pair of socks can be made by making abstract geometric designs on them. Set the socks aside to dry according to the manufacturer's instructions on the paint bottle. What Kind of Paint to Use on "Crocs"